A traditional dish from Milan, Osso Buco is very easy to prepare. There are two versions, the older and more traditional version is made with white wine whilst this one, which is more modern and popular is cooked in a rich tomato sauce. 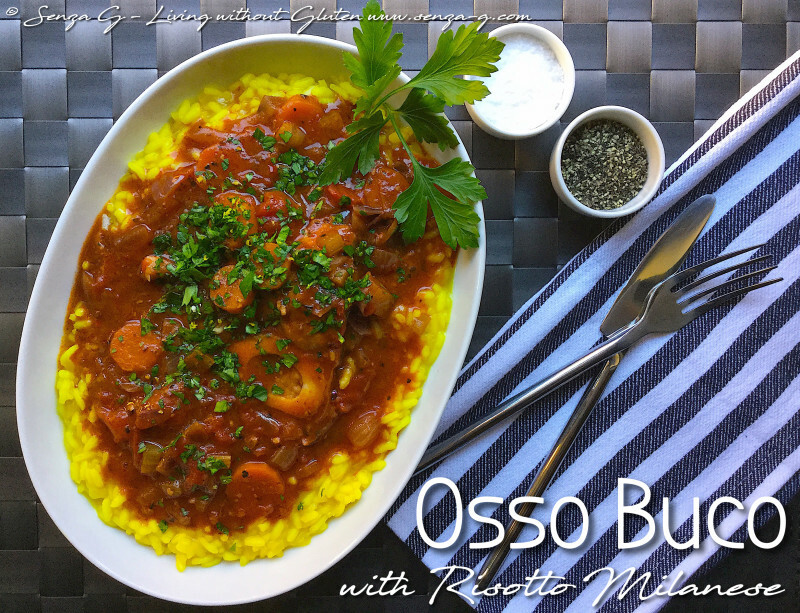 Usually it is served with Risotto Milanese, made with Saffron, but many also serve Osso Buco on creamy polenta. Place the veal shanks on a tray and season with salt & pepper and sprinkle with gluten free flour, turn over and sprinkle again with flour. Heat oil in a pan over medium-high heat. Cook the veal shanks for 5 minutes each side until browned. Transfer to a plate and set aside. Add onion, garlic, carrot and celery to the pan and cook until the vegetables start to brown. Pour in the wine, the herbs and spices, the balsamic vinegar and sugar, stirring all the while until the wine evaporates. Add the chopped tomatoes and the stock and bring to a boil. Check for seasoning. Lower the heat and put the veal shanks back into the pan. Cover them with the sauce. Place the lid over the pan and cook slowly until the meat is tender. Remove the bay leaves. If sauce is too thin, thicken with a mix of 1 tsp cornstarch and a little water. To make the Gremolada, simply combine all the ingredients in a bowl. Serve over Risotto Milanese or Polenta and sprinkle the top with the Gremolada.